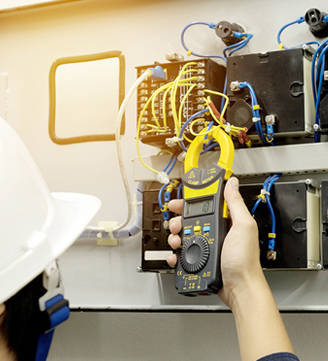 From simple household tasks to complex industrial applications, our master electricians have the equipment, experience and expertise needed to handle a wide range of electrical services. A privately-held electrical contractor, Electric Blue, Inc. serves all of the Denver Metro area, including Castle Rock, Castle Pines, Sedalia, Franktown and Elizabeth areas. We have built our business on the lifelong relationships we build with our customers - some of our customers have been with us for over 20 years! Our team’s commitment to our customers is a trusted friendship that lasts for years. Collectively, our electrical team has over 45 years of experience in the industry, so they have seen it all! Our focus is on safety, dependability and knowledge when addressing your electrical issues. Our master electrician has a vast knowledge of residential, commercial and industrial applications, and he is dedicated to providing a strong project from conception to completion. He uses current codes and time management, all while maintaining budget. We have a simple work ethic and pride ourselves on two things: integrity and craftsmanship. Our company believes that a work day isn’t just a job for our electrician, but a chance for them to show off their skills and talents with each task. As for integrity, that just comes from the high quality of people they are. We only hire the best electricians because we believe our customers deserve top quality services. We thank you for taking the time to read about us. It is our pleasure to serve you! Please contact us today with any questions or to schedule an estimate for your electrical project.